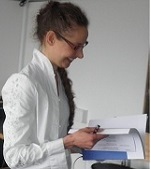 Magdalena Lis holds a Ph.D. from the Centre for Language Technology, University of Copenhagen. She has been working in the area of Corpus Linguistics, Cognitive Semantics and Multimodal Communication. She has a.o. created a framework for investigating multimodal communication using wordnets – electronic semantic-lexical networks. Magdalena’s research within the project “Common Language Resources and their Applications” (CLARA) was situated in the work package Multimedia and Multimodal Communication Modeling in collaboration with the Max Planck Institute for Psycholinguistics in the Netherlands.